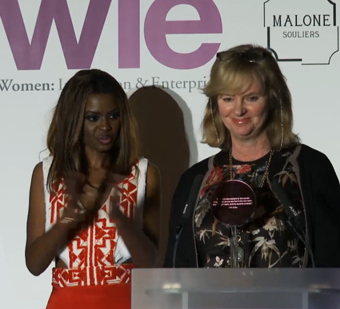 Last night (27th April 15) the likes of Joanna Lumley, Caroline Rush, Malaika Firth and Erin O’Connor were just some of the high profile names celebrating the fifth Women: Inspiration and Enterprise (WIE) Awards. The WIE Awards celebrates inspirational women that have used their experience and influence as entrepreneurs to make a positive difference to the lives of others, in particular other women. WIE launched its first symposium and awards ceremony in New York in 2010. The WIE mission was to provide a platform for this generation’s female leaders to inspire and empower the next. The symposium featured more than 70 exceptional speakers, including Arianna Huffington, Melinda Gates, Sarah Brown, Queen Rania and Donna Karan. 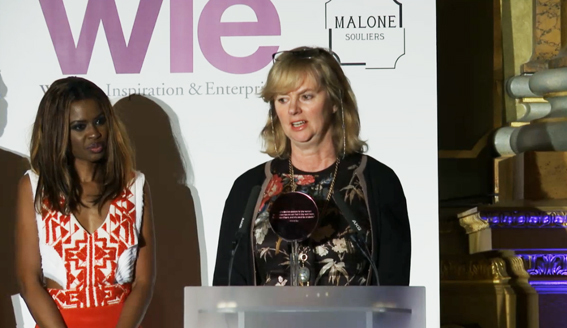 By 2012 WIE launched in the UK and has since inspired and connected leading industry figures across many sectors of industry. The ceremony opened with some powerful speeches from the likes of Aldijana Sisic, chief of the UN Trust Fund to end violence against women, Professor Frances Corner, head of the London College of Fashion and Caroline Rush, CEO of the British Fashion Council. This was followed by a fashion show debuting the ‘Legacy Collection’ from the LDNY Foundation, led by founder June Sarpong and David Rice. The LDNY Foundation is a charity that assists young people from low-income families to gain entry into the creative industries and fulfill their potential. It’s an absolute delight to be here. I can’t tell you what it’s like to work with these people (young people in Haringey). I am on a table that’s called ‘Hope’ and we can all give hope to these people. “We started the business in 2006 and we had three people working with us, those people are still with us today. We now have a factory making 7’000 garments per week for the likes of ASOS.com and Marks & Spencer ‘Best of British’ and we realized we had a real skills shortage and that skills shortage meant we had the opportunity to retrain. “The whole work force comes from Eastern Europe or China so we opened up the Stitching Academy three years ago which was extremely successful and opened up the apprenticeship programme as well. When you take somebody that has no confidence what-so-ever and they do a six-week course and during that time you seek out their personalities, you can see them grow and really flourish – that is rewarding. And these people have gone on to work at Marks & Spencer on a two-year apprenticeship, they are working at River Island, ASOS.com, New Look, the possibilities are endless. The Fashion Technology Academy (FTA) is a collaboration with Fashion Enter Ltd – sister company to FashionCapital.co.uk, Haringey Council, DWP and global e-tailer ASOS.com. Opened in March 2015 the fully equipped FTA is the first apparel manufacturing training academy in the country to operate alongside a live factory environment ensuring that students gain exposure to real manufacturing whilst training for their qualifications. To find out more about the FTA click here.